I hope you won’t mind, but I’d like to toot my own horn for a little bit. Just today, I promise. A few weeks ago I was contacted by the editor in chief of Crochet Today asking if they could have a couple of my box bags for their November/December issue. At first I wasn’t sure if it was real or not so I emailed back asking for more information. The next day I got more information including the fact that they needed the bags 2 days later (Friday) for the photoshoot on Monday. I had them pick what they wanted out of my inventory and the next day I was sending my bags overnight. I got confirmation that they’d arrive but until this week I didn’t know if they’d made it in or when I’d get the bags back. A week ago I got an email letting me know that the bags were shipping back to me as well as a copy of the magazine. Let’s just say that I was totally ecstatic about this! I got the bags and the magazine a couple days later and here I am! I’m really, really thrilled about this opportunity. I think it’s really awesome that I could be a part of this. Thank you so much Linda and Crochet Today! I believe that the magazine will be out in stores on October 6 if you want to check it out for yourself. If you want to purchase the bags featured in the magazine, they should be up in the shop as well as many others. Congratulations! That is an excellent accomplishment. Toot toot! You should absolutely sound that horn. Your bags are gorgeous, practical and pretty much everything I love in a project bag. Sooooo glad to see the rest of the world catching on. Congrats!!! That is so VERY exciting…you’re going to be famous! 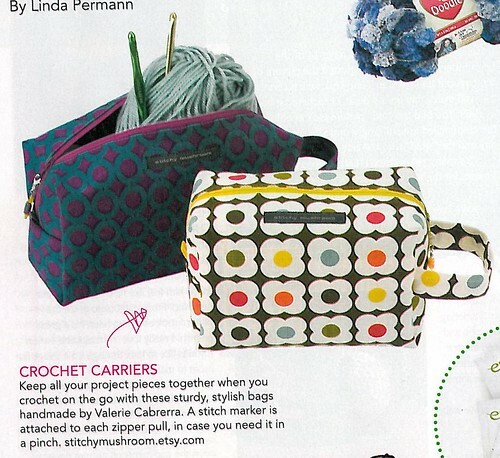 That would be great if the crocheters got onboard too, you really could use these little bags for anything. I know I love mine! I got the issue last week and saw your bags. Congrats! Well! I’m glad I got my claim in early! Congratulations!!! What a terrific achievement!